The V2 Plate™ is a 3/8" high density Polyethylene plate covered with nylon pack cloth. The nylon cover has multiple webbing reinforcements sewn to it, and is closed with Velcro so the plate can be easily removed. The sides of the nylon cover have 2" wide Velcro strips which match up with the 2" wide Velcro on the V2 Molar Bean Bag™. The plate is 8" x 8" and has three holes drilled in it. The center hole is tapped and threaded for a 3/8" 16 thread bolt which is installed. The other two holes are 1/4 inch that match the 1/4 20 thread holes on a Really Right Stuff B2 LRI or B2 LLRII clamp. We provide two 1/4 20 screws in case you want to mount one of these two clamps on your plate. You can purchase the clamp from Really Right Stuff. 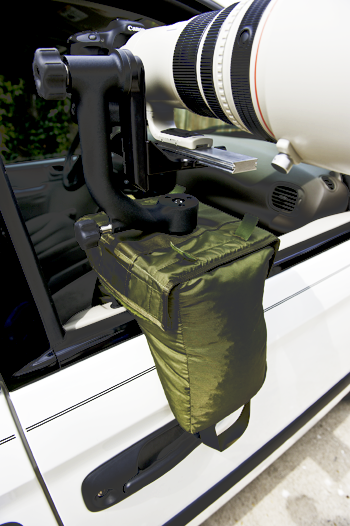 You can also mount a Really Right Stuff PCL-1 panning clamp to the V2 Plate™. This provides a low center of gravity mount enabling you to pan easily. The V2 Plate™ allows you to mount any gimbal head like a Wimberley head or any other gimbal head with a 3/8 16 threaded hole. You can also mount any ball head with a 3/8 16 thread hole. If you mount a ball head that has an Arca Swiss type clamp you can also mount a Wimberley Sidekick to the ball head. 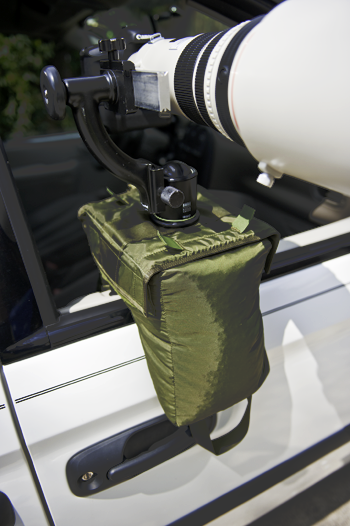 When used with the V2 Molar Bean Bag™ the V2 Plate™ provides a very solid attachment and platform for your big lens. 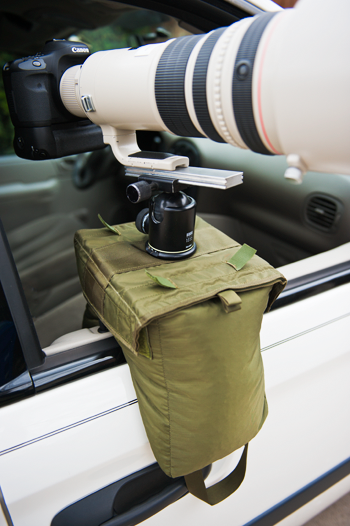 It also allows you to quickly remove the plate, enabling you to lay your lens directly on the bag, or turn the bag on its side or upside down to shoot on the ground, hood, trunk, or roof of your vehicle. 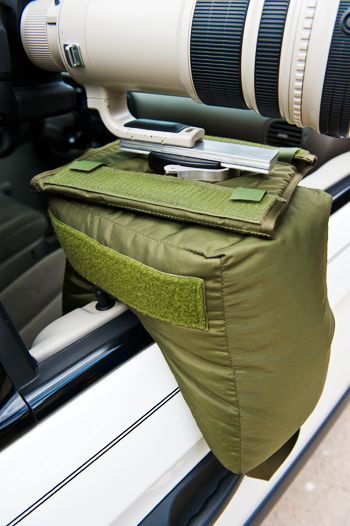 Attaching a ball head or a gimbal head to your bean bag does give you more movement capabilities. However it is not the same as standing on the ground with a tripod, as your range of motion is reduced in a vehicle. Advantages of our plate Our plate is square not rectangular which means it is more stable in all directions. You can also snug the plate to the bag well because you can pull the plate tightly against the bag and then Velcro it to the side of the bag. 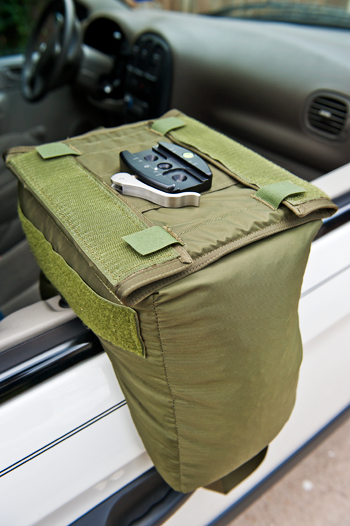 Because of the Velcro you can quickly install or remove the plate from the bag. 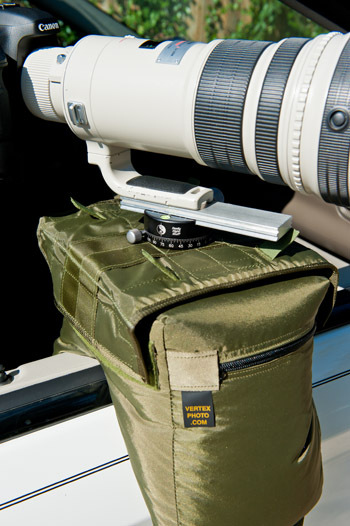 Your ball or gimbal head can be mounted on the plate and attached to the bag whenever you are ready. The V2 Plate™ is optional and can be purchased with the V2 Molar Bean Bag™ or at a later time.